Loui, well aren’t you a beautiful boy! That beautiful blue-grey coat, the white breastplate and big smile upon your face… I so wish I could pet you and let you know it’ll be all right. Your person will come, and when the two of you meet furever friends you’ll be! 1. Not having a furever family to care for him. 2. Being born with the unfortunate moniker “pit bull”. If you think you may be interested in adopting a pit bull please be sure to check your local breed restriction legislation and any rules within your housing community. Loui is a beauty, but he is only one of thousands and thousands of dogs scheduled to be euthanized this week throughout America. Please do not consider adopting Loui or any other animal because you feel sorry for them. It is vitally important to the well-being of any animal you decide to adopt that you first evaluate your life circumstances before bringing any pet into your home. It is important that the pet you bring into your home fits your lifestyle. Seeking Love Saturdays is my way of helping homeless animals find furever homes while at the same time trying to enlighten and educate people about pit bulls. 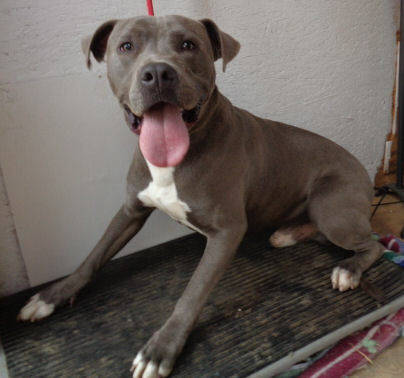 If you are in California and interested in visiting Loui and seeing if he is the friend your heart is yearning for please read the Adopt a Pit Bull Q & A. It will help you know what kind of questions you should ask when inquiring about Loui at 661-721-3377. It is very likely that if you already own a dog, they will require the dogs to meet prior to adoption. Dogs, like people, have personalities. They want and deserve a happy life filled with fun, love, and loyalty too. Shelter dogs typically make the best dogs because they know how the “other half lives”. And remember, there are no such thing as bad dogs, only bad owners. Treat your animals with respect and kindness, get them properly socialized and they’ll be the best dogs in the world! Next > Help, I’ve Fallen Off the Web and I Can’t Get Up!